Do more press ups. Yep that’s the secret. If you want to get good at something, don’t do something else – do the thing you are trying to get good at! – Decide on a language and stick to it. Some people keep changing language and never make a game. – Make a simple engine and then get straight on with making a game. Your engine can improve as you write the game. If you spend all your time making a mega engine filled with obscure features that you may never use, you game will never get started. – Concentrate on programming the game instead of making graphics and sound/music, otherwise the game will take twice as long. Find someone else to do the non-programming (including marketing) for you. You should still take an “interest” in the graphics and sound for your game because you will have to direct the artist/musician in what you want and ask them to fix/improve it if it’s not right. – If you’ve never made a “finished” game before, then start with a really simple small project because I guarantee it will take longer and be harder than you realised. Make sure it really is finished in the sense that it has a loading screen, title screen, options screen, high scores, game screen with lots of levels, level complete screen, and a game finished sequence at the very least. Professional games have more screens like credits, trophies/awards, introduction, instructions/hints, story, map, level complete stats etc. These all take a long time to program. Once you’ve finished a small project, make another, and another gradually increasing the size and complexity until you feel confident that your game is good enough to be sold (if that’s your aim). – Play games for research in moderation. You could play lots of games and say that you are doing “research”; well some research is good, essential in fact, but get the balance right. By the way, watching TV is not research. However, I do condone sport or healthy activities as anything that keeps your body healthy keeps your mind healthy and so you’ll be more productive when you are programming games. – Only read blogs/forums/articles about stuff directly related to game programming in the sector you are aiming for. There’s no point in reading stuff about AAA games if you are making casual games for example. There’s no point reading loads of stuff about Internet Marketing if you are not going to sell the game on your own website anyway because you are going to use a portal. – Get friends and family and forum members to test your games and give you feedback. Then listen to the feedback and implement it. You need external feedback to improve your games instead of being stuck in your own little world. Well the post title says it all! I signed the contract yesterday! I currently write games for Big Fish Games as a contractor and it’s a great job. But a couple of months ago I got an email from BFG half-jokingly saying “We’re opening a new studio in Vancouver, are you interested in being the first designer/programmer there?”. My immediate thought was “this sounds cool, yes I am interested!”, so I got back to them and asked for more details. Helen (my partner) and I had been discussing living in other countries for a few months at a time (particularly in wintertime to escape the British weather) anyway, so it wasn’t a big shock to get this offer and consider it. Because we both work at home and use the Internet and PCs to do our jobs, we could in fact be based anywhere. So we had talked about going somewhere warmer and working there just for the experience. 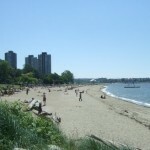 Working for BFG in Vancouver is bound to be an experience worth having, even if the weather is not much different from England. It will also be a great learning experience for the kids. BFG paid for us to fly to Seattle, where they are based, and meet lots of nice people, and I was interviewed for a day and half. You can read about our trip here. Then we went up to Vancouver (it’s just over 100 miles away) and checked it out. We really liked it. It’s next to the sea and has beaches, parks, lakes, mountains etc. The down town area is not massive, you can walk across it easily, and there are really nice places for a family to live hardly any distance from the centre. You can rent wooden houses on a plot of land with a garden in a nice quiet neighbourhood that is a couple of blocks from a main street, or a couple of blocks from a beach the other way! Very handy. So I’ll be an employee again instead of running my own company. In some ways this feels like a step backwards, but I’m doing it for the experience. I’ll be working with some great people and will be learning tons about the casual game industry, and I’ll enjoy every day at my job, plus I’ll get paid (very well) regularly. I’ll be loosing the flexibility of working at home, and my independence for a minimum of 2 years but I’m willing to make that trade for the experience. I love making games and I’ll be able to make really great games with the resources of BFG at my disposal. So it’s swings and roundabouts of course. One thing I’ll have to do is make sure I remain fit and healthy as I’ll be sitting at a desk for 8 hours a day! I’ve been at Bridport Aikido Club for 11 years, and running it for 5 years. It will be sad to leave but I have two black belts who can take over. When I’m in Vancouver I’ll set up an Aikido club and get training as soon as possible. Then I can arrange a special Summer or Winter school where my Sensei and people from England come to visit for a week of training – it should be great fun. We will keep our house in the UK as a base and will rent it out whilst we are gone. So we are currently embarking on a host of home improvements to make it suitable for renting. We are also de-cluttering by recycling, giving away, selling or dumping loads of our stuff. We don’t want to put much in storage as it’s expensive and we don’t want to ship much over there – the idea of starting afresh with minimal stuff is quite nice. I’m crazy busy with my current game, so Helen is dealing with most of this (phew). Well we don’t even know the answer to this. BFG are applying for a Visa for me, but that may take a couple of months, and there’s a slim chance it won’t work out. But the aim is to move later this year, perhaps in October or November. So watch this space and I’ll proffer more details as they occur. Wish us luck! You are currently browsing the Grey Alien Games weblog archives	for August, 2008.